Manchester-based rockers James have announced plans for a North and South American tour that will include performances at the Coachella Festival in Indio, California on April 13. Full tour dates are available after the jump. The tour will coincide with the release of The Gathering Sound, the band’s twelfth studio album since coming together in 1982. The prolific group has gone through multiple lineup changes, and this tour brings the 2001 lineup back together for the first time since the departure of lead singer Tim Booth in 2001. The forthcoming album will be released as a limited-edition deluxe box set on a yet-to-be-announced date this spring. 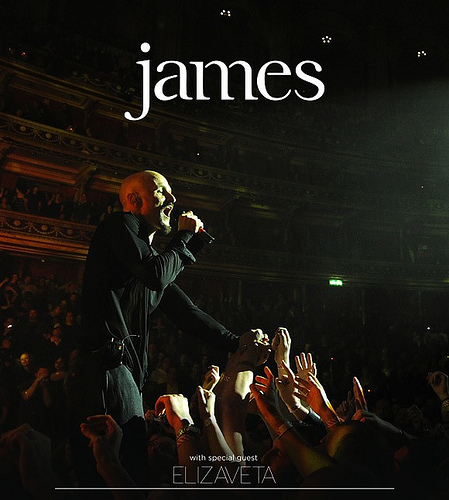 The set will include three CDs, a DVD, a 12” vinyl record and a J-shaped USB stick holding James’ eleven studio albums and non-album best-of tracks.